Halloween is a fun time of year for everyone involved. It is the time when people get to pretend to be someone, or something, else! It is when you can enjoy being scared and scaring others. This is why Halloween scavenger hunt clues, whether riddle clues or Halloween photo scavenger hunt clues, can be so much fun! Don’t just think of following clue to clue, but instead consider including challenges and Halloween games, scary tricks and many surprises. Our Halloween scavenger hunt lists of riddles are just the start, the structure of the game and the fun is only limited by your imagination. Our Halloween photo scavenger hunt clues don’t need much thought or organization, as they are already crazy and fun photographic challenges. Halloween is a great time to organize themed activities. Everybody’s in the costume and in the mood for a sweet treat, so taking the opportunity to create a fantastic trick in the form of a creepy scavenger hunt will make the most out of a ghoulish evening. Choosing what kind of scavenger hunt to create is half the fun with so many types of clues and formats to choose from. You can buy premade photo scavenger hunt lists from our website, choose fun clues from our free scavenger hunt lists, or create your own. For big groups, team challenges mixed with riddles or Halloween themed trivia can pace the night and keep the fun going. You can even get the kids involved in DIY challenge stations where your players can take photos or get messy with fun fall activities like bobbing for apples. Younger kids might not be eager to spend too long trick-or-treating, so setting up a fun, indoor activity will give them a chance to rest while still enjoying the fun of Halloween. You can invite lots of kids over for a team-based scavenger hunt or keep it small with a solo hunt. If you’re looking for an activity to keep your kids busy between school and going out trick-or-treating, a quick solo scavenger hunt is a great option. You can hide treats or even parts of costumes around the house for a quick bit of fun while waiting for it to get dark enough to go out. You don’t have to make the rewards too big if you’re planning on going out, but it’ll keep those restless kiddies occupied while you get ready. Indoor scavenger hunts can also be used in the classroom. Incorporating some fun, educational Halloween trivia can keep it academic while catering to those excited pupils. Depending on the weather, you might want to take your scavenger hunt outside. It will give your kids a chance to run around in their costumes for a little while and play, as well as giving you time to get ready to take them out. A backyard scavenger hunt can include anything from photo clues, to activities, to riddles. Have your kids decorate their swing set or your garden, or even have them carve (or draw for the younger ones) a jack-o-lantern. You can also always blend indoor and outdoor activities. Add some fun and a bit of exercise to your normal trick-or-treating route by incorporating a photo scavenger hunt. Have your kids find specific costumes or decorations as challenges. A blended list with riddles, photos, and treasure hunt clues can help keep your kids busy and make sure they don’t start dipping into their candy before the night is through. You’ll have plenty of mementos and your kids will never forget how fun their Halloween was. Creating clues is always fun, but not everybody has the time. 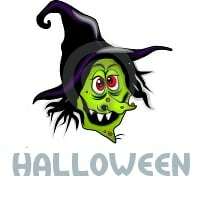 We provide plenty of pre-made Halloween photo scavenger hunt lists and traditional Halloween riddle scavenger hunt lists. You can choose to use them as is, or build on them and personalize them so that you can use them again and again every year.